Famous for being the amusing Taco Bell spokesperson, the Chihuahua dog is an energetic, alert and intelligent dog, which seems to be made for people living in apartments or metropolitan areas where it is difficult to find places for a dog to run freely. These little dogs have the most often misspelled name, and it is common to see it spelled as Chiwawa, Chihauhua, and Chihauhau, by those who have no idea how spell it. Due to their small size (anywhere from three to fifteen pounds), this little dog does not require much exercise, which makes them popular with the elderly who often have limited mobility and may not be able to take a dog outside. In addition, the short-haired variety is low maintenance when it comes to grooming, but even the long-haired little dogs do not need to be groomed every day. Chihuahuas have mysterious beginnings and it is not known exactly how they developed into the distinctly small dogs they are today. Fossils of what researchers think are the original Mexican dog have been discovered in Chihuahua, Mexico and date back to the 6th century A.D. However, other specimens have also been found in South America dating from around this time. Today, the Chihuahua dog is the 12th most popular dog in the U.S. simply because this little dog requires little exercise (they get enough running from one room to another) does not eat much and makes a great companion or "purse" dog. As the most common type of Chihuahua, the apple-head Chihuahua dog refers to the shape of a puppy's head because the skull is wider than the jaw. Generally, an apple-head possesses a 90 degree angle from the forehead down to the short snout and has protruding eyes. The deer-head Chihuahua does not have the 90 degree angle from forehead to nose like the apple-head but rather has a more sloped forehead and longer snout, which makes the dog resemble a fawn, or baby deer. In addition, they have a more slender bone structure than apple-heads and delicately small paws, which further enhances their resemblance to a tiny fawn. While people frequently sell Chihuahuas under the designation of "teacup" or "pocket", these terms are erroneous in regards to the type of dog it really is. All of these little dogs belong in the "toy" breed category and the only difference is in the deer and apple head. You can find Chihuahuas in just about any solid color or color blend, with a wide variety in color patterns. Red, off-white, fawn, brown and black are some of the more common colors seen in Chihuahua coats. As far as dog shows are concerned, the color or patterns of colors on this toy dog’s coat is irrelevant to the judges; no one color combination is more favorable than another shade. Probably the most noteworthy characteristic of a Chihuahua dog is his sincere devotion to his owner. This dog will show unlimited amounts of affection to his master, but explicitly demand it in return. If the dog is not receiving as much attention as he feels he should be getting, the dog will engage in almost histrionic antics until he gets it. 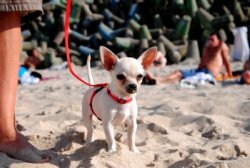 Some people have described the Chihuahua dog as suffering from a classic case of co-dependency but that is what makes them so desired as companion dogs. In addition, their courageousness and somewhat cavalier attitude sometimes gets them into difficulties with strangers and other dogs as they tend to confront whoever they feel like confronting with rapid barking and nipping. Due to having easily breakable bones around the throat and neck, an owner should never use a collar when taking the dog for a walk on a leash. Use a properly fitting harness instead.